Steven Spielberg began production of The Post in May 2017, and the film premiered before the end of that year. The combination of Spielberg, Meryl Streep, and Tom Hanks results in a film as impressive as you'd expect (and recalls the "Cruise/Kidman/Kubrick" publicity campaign for Eyes Wide Shut). Streep and Hanks both give superb performances, of course, though their roles aren't especially demanding. The Post of the title is The Washington Post, which published the Pentagon Papers after an injunction was issued against The New York Times. But the film's emphasis on the Post does a disservice to the Times, which had printed the Pentagon Papers first. The debate that the film dramatises, between the Post's publisher, editor, and lawyers, also took place at the Times, which would have made an equally dramatic story. The film naturally invites comparisons with All the President's Men. 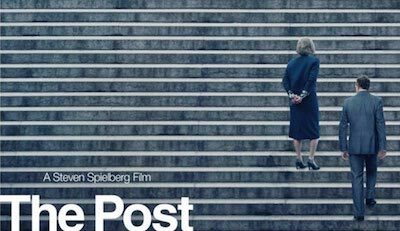 The Post even positions itself as a prequel to the earlier film, ending with a security guard discovering the Watergate burglary. It's not as tense as that classic thriller, though its script (co-written by one of the writers of Spotlight) does justice to its historic subject matter. And its central theme - journalists exposing government lies and media suppression - is as relevant as ever, given Trump's increasingly Nixonian presidency.